Back in 2011, Americans spent more than $50 billion on beauty products. Everyone wants beautiful looking skin. But not everyone’s willing to put in the effort. After all, your skin is a reflection of how well you’re doing internally. From eating healthy to exercising and keeping stress levels low, healthy habits can be quite the challenge. While some beauty products do help, they can easily become expensive to use. Fortunately, coconut oil exists. This versatile superfood supports healthy skin and is a lot less expensive. Why Is Coconut Oil Good For The Skin? The lauric acid found in coconut oil improves skin conditions by healing wounds, reducing rashes and preventing acne. Vitamin E acts as a powerful antioxidant that protects your skin from free radicals, which speed up the aging process. Coconut oil helps your body absorb vitamin E more easily through the skin. This was shown in a study in Canada in 1999 at the University of Western Onatario. 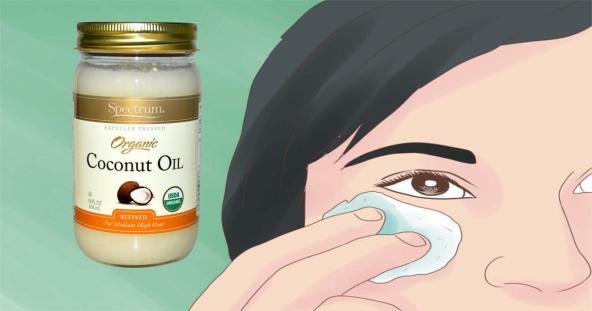 Using coconut oil on your face is pretty straightforward. You’ll need unrefined cold-pressed coconut oil. 1. Every morning and night, wash your face with water, then lightly dab dry, don’t rub.